Pennsylvania marriage record for Mary Genetti to Christopher Martini, 1885. Click to enlarge. Don Lingousky and his wife, Joyce, have done it again! While searching through old marriage records online, Don stumbled upon an intriguing mystery. He promptly emailed me with his findings and the three of us went to work digging for evidence. Don’s clue had uncovered an unknown marriage for our 2nd great-aunt, Anna Maria “Mary” Genetti Zambotti (1859-1937), daughter of Leone and Cattarina Genetti. If you remember past posts, Don and I are 3rd cousins. My great-grandfather, Damiano Genetti (1857-1944), was the brother of Don’s great-grandmother, Angeline Maddalena Genetti Recla (1865-1937). And the great-aunt in question, Mary Genetti Zambotti, was the sister of Damiano and Angeline. During the late 1800’s and early 1900’s, the three siblings, along with their younger brother, Rafaele (1867-1949), established themselves as entrepreneurial business owners in the towns of Weston, Hazleton and Sheppton, Pennsylvania. Don and Joyce are great genealogy sleuths and have added many wonderful finds to our family website. Don’s sharp eye caught an interesting notation on the marriage record issued to Peter Zambotti and Mary Genetti in 1896 – strangely Mary’s maiden name is listed as Martini, not Genetti! 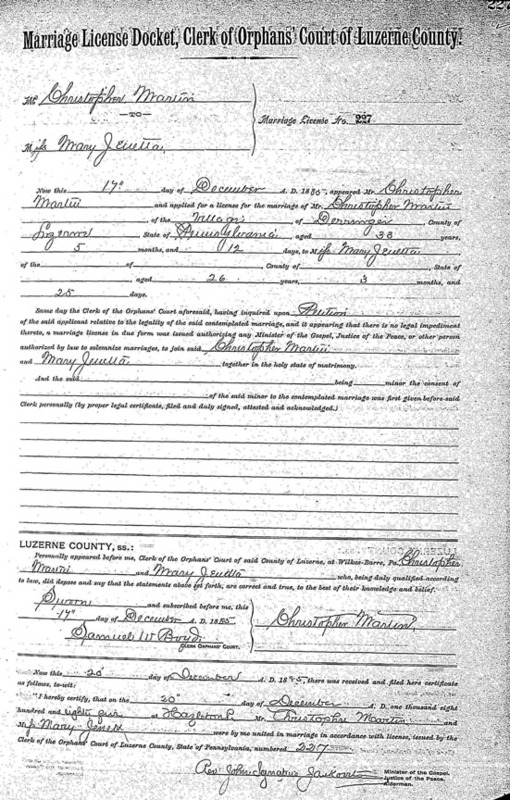 2nd Pennsylvania marriage record for Mary (Genetti) Martini and Peter Zambotti, 1896. Click to enlarge. According to the certificate, Mary had been married before, with the first marriage dissolved due to death. None of our records stated that Mary Genetti was married twice! Nor was this reflected in our family tree. Don went back and searched again, soon finding Mary’s first marriage record. It had been overlooked since the names of both husband and wife were misspelled by the attending clerk. Mary’s first marriage was to Christopher Martini in December of 1885. This life event had slipped through the historic cracks of time, probably escaping our family memory because there were no descendants from Mary and Christopher’s short marriage. Mary Genetti and Peter Zambotti, probably 1895 or 1896. Don, Joyce and I consulted various genealogy websites and data bases. Finally we located Christopher’s birth record in the Italian registry maintained by Nati in Trentino (see explanation below). Like Mary, Christopher was a fellow Tyrolean born in the neighboring village of Revo on July 25,1852. His baptismal name was Cristoforo Mattia Martini. And his birth date closely matched the wedding register. Although we have no evidence to tie this birth record to Mary’s first husband, we are fairly sure this was the same “Christopher”. Unfortunately a good deal more digging, turned up no further info – no death certificate or obituary, no tombstone, no family trees with the name of Cristoforo “Christopher” Martini. All we know is that he died sometime between 1885 and 1895. According to Mary’s second marriage record dated January of 1896, she married Peter Zambotti, a fellow Tyrolean from her home village of Castelfondo. Peter had arrived in America just the year before in 1895. The couple had one child, a son named John born in 1897 who died at the young age of thirty. We know this because John is noted in the 1900 and 1920 Federal Census. He also has a WW I draft registration card on file and we were able to locate his Pennsylvania death certificate. Plus we had photos of John’s tombstone in the Weston, PA cemetery where both of his parents were buried. While researching this story, I took a closer look at the photo of John’s marker. In 2012 I had spent some time photographing tombstones in the Sacred Heart Cemetery where many of my ancestors are buried. When I found the photo of John Zambotti’s marker on my hard drive, an interesting surprise was clearly visible on the stone. 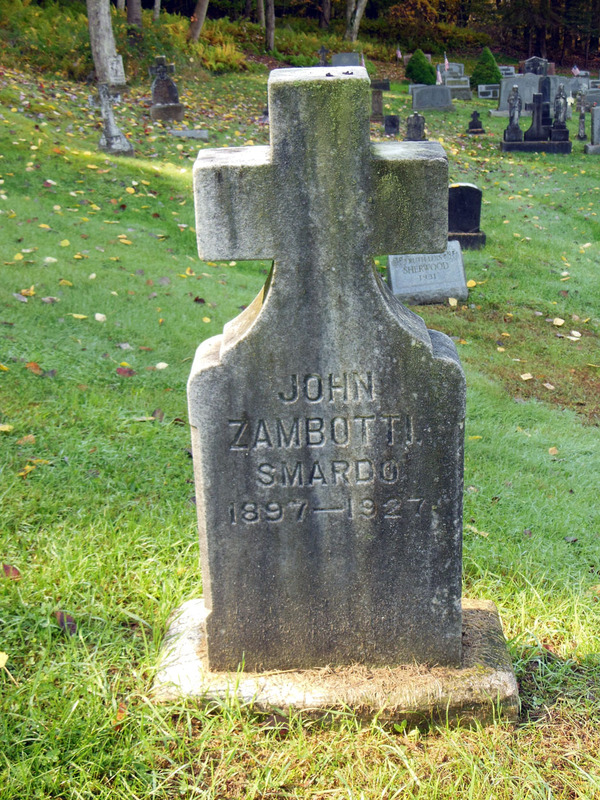 His name was engraved “John Zambotti Smardo”. The unfamiliar name of “Smardo” was also on his death certificate. Joyce and I mulled this over for a few days and came to the conclusion that John must have been adopted by Mary and Peter. “Smardo” was his birth surname. We ran this hypothesis past Don. It was then that he remembered his grandmother’s family history had listed John Zambotti as being adopted. Another mystery solved! Sadly, John passed away in 1927 from tuberculosis. His occupation was listed as “miner”, he was single and left no heirs. Thank you once again Don and Joyce Lingousky for your tenacious research! I have made updates to our family tree and corrected the ancestral record. Click here to access Nati in Trentino.